5 DVD boxed set with new 2009 5.1 DTS and Dolby Digital sound mixes, includes the DVD debuts of The Mama Tour and Three Sides Live. 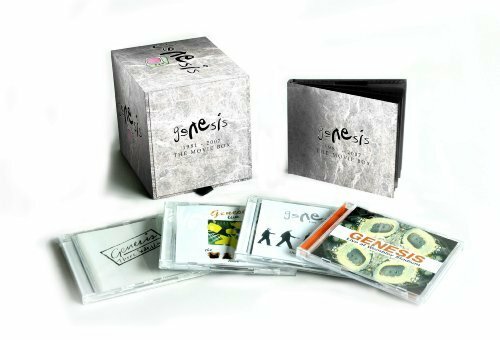 This DVD box set also includes Genesis Live At Wembley Stadium, Genesis: The Way We Walk-Live In Concert, and VH-1 Behind The Music. Three Sides Live, the concert film shot at Nassau Coliseum and released in tandem with the live album of the same title, which made the Top Ten on both sides of the Atlantic in 1982. Contains extra full length tracks in 5.1 Audio only. Available on DVD for the first time.Genesis Live The Mama Tour, filmed in 1984 at the National Exhibition Centre in Birmingham, and featuring the band performing material from the chart-topping Genesis album. Also features The Making of the Mama Album, a home video filmed by Phil Collins during the making of the Genesis album. Available on DVD for the first time. Genesis Live At Wembley Stadium, shot during the group's record-breaking run of four sold-out concerts in July 1987, at the height of their popularity following the release of the number one album Invisible Touch. The DVD also features the tour documentary entitled Visible Touch. Genesis: The Way We Walk Live In Concert, filmed in 1992 at London's Earls Court Exhibition Centre, and issued alongside the albums Live The Way We Walk Volume One: The Shorts and Volume Two: The Longs. Bonus material alongside The Mama Documentary comes in the shape of the updated 2009 version of VH1 Behind The Music special about the band. The original version aired in December 1999.